Widely-distributed among islands in the Indian Ocean, from Madagascar and the Mascarenes north to the Seychelles. In mainland Africa it has been reported from Malawi and likely occurs in Mozambique. A fairly large, dark to metallic blue butterfly when viewed from the upperside, with two white bars at the tip of each forewing and a distinctive pattern of black bars both along and across the wings (see main photo and also here). There is a white rim to the wings. Males possess a single reddish-brown eyespot with a yellow rim on each hindwing, and a less distinct dark-edged blue spot on the forewing, which may be indistinct. In females, these are reddish-brown, and a larger dark brown eyespot is present towards the front of the hindwing, in addition to the yellow-rimmed spots (see photo here) Females also differ in having extensive chocolate-brown areas along the leading edge of the hindwing (in males these are reduced to a patch along the centre of the leading edge, and may be invisible at rest), a dark brown border to the forewing and brighter white markings. The underwings consist of an alternating pattern of wavy whitish and light brown bands, with a thicker, darker brown bar parallel with the edge of the hindwing. Two yellow-edged black eyespots are present within this bar, the larger near the base of the wing and the smaller over halfway up its length. A smaller pale spot connects with this second spot. See an illustration of the underwings here. 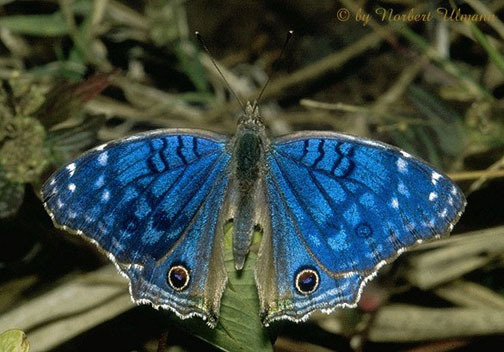 Similar species: Other blue-winged butterflies are generally considerably smaller and lack brown eyespots, and do not exhibit the characteristic patterning of the brilliant blue. 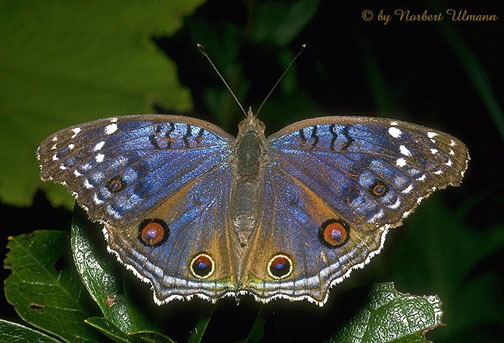 Among similarly-patterned species, the blue pansy (Junonia orithya) is most similar, with bright blue hindwings and red eyespots; however this species has black forewings. Other similar species with blue markings are readily distinguishable in having black or otherwise differently-coloured wings. Lowland, often coastal, areas, where it can occur in abundance. It favours disturbed areas with abundant low vegetation. In Mauritius, adults have been observed to favour flowers of the snake vine Stachytarpheta jamacinensis.